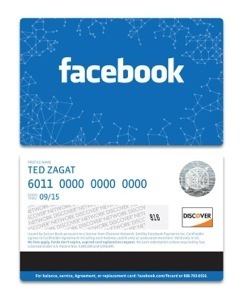 Will the Facebook Card Be in Your Wallet? It’s a digital world, there’s no doubt of that. People are tweeting on the bus, checking in at restaurants on Foursquare, and the constant soft-blue glow of the mobile screen is reflected in faces everywhere. The past 20 years have taken the Internet from being an esoteric playground for the self-proclaimed digerati to becoming an everyday utility, nearly ubiquitous in nature. Still, there is a pronounced difference between the virtual world and the day-to-day “meatspace” of unplugged life. The attempt to bridge the two is a bit of a holy grail, particularly for brand managers and marketers. Facebook, in its ongoing quest to monetize, is the latest company to make that attempt. The technique this time? Gift cards. Last Thursday, Facebook debuted a physical gift card, with participation of Jamba Juice, Olive Garden, Sephora, and Target. The cards can be purchased on Facebook and are mailed to the recipient. The purchaser loads them with a spendable balance. Nothing really amazing and new so far. What’s unique about the card, is that funds must be allocated to specific retailers, and do not come from a central fund that can be used for any location. Gift-givers can chose to split up and allocate the money they send — for example, giving $10 each to Target and Jamba Juice through a $20 gift — but once the retailer has been selected, the money is locked in and can only be used for that brand. In some ways, this is a natural extension of Facebook’s Gifts platform, which launched late in 2012 and has seen middling success to this point. In other ways, this is a strange move from Facebook, who’s tried entering the physical retail space before with its failed Credits program. This is also somewhat unexpected as yesterday, during Facebook’s Q4 earnings call, Zuckerberg said Facebook Gifts accounted for under $5 million of the company’s total revenue, and hinted that he didn’t see it as a huge point of growth in the immediate future. On the upside, Facebook shares, after falling sharply on worries about its spending plans this year, are now up a fraction at $31.33. There is a number of interesting points about the new gift cards. For one thing, the segregation between vendors. Instead of a pooled common balance that can be spent with authorized retailers the card holds dedicated balances for each of the companies involved. While I’m sure that the retailers will be quite happy that money dedicated to them can only be spent with their companies it’s not the most convenient arrangement for the end user (is anyone really surprised at that coming from Facebook?). The next salient point is that the card can be virtually reloaded by anyone. Once the first physical card has been revived in the mail any additional Faceboook card balances bought for that person by someone else will appear on the card they already have. Additionally, it remains to be seen just how much Facebook’s untrustworthy reputation influences people’s decision to spend money with the company. Will the constant heat over privacy issues make people less likely to trust Facebook with their money? Only time will tell. Another thing to keep an eye on is the addition of new retailers. Olive Garden and Target are a good start, but the long-term viability will hinge at least in part on the array of places it can be used at. What do you think? Will the new Facebook card be in your wallet?